When the job finishes, the files are placed in the Results folder, accessible via the home panel. Click on an image result for further inspection as explained in Results . The number of tools shown in the detailed view depends on the type of restoration, the image geometry and the HRM configuration. 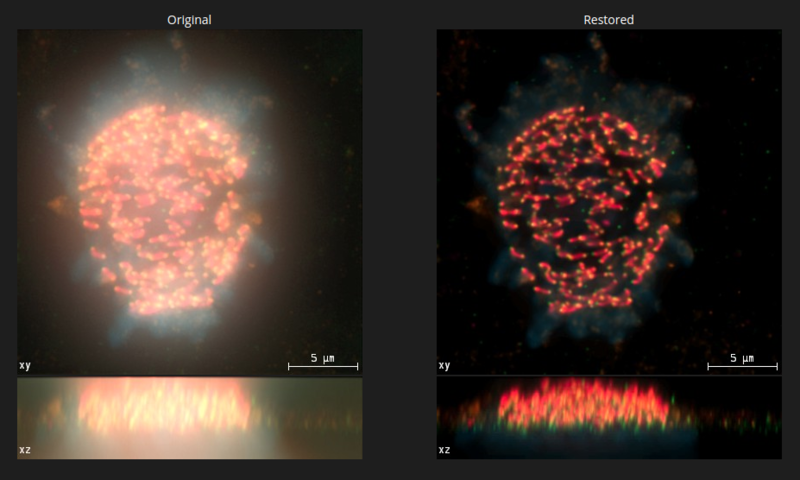 A comparison of the Maximum Intensity Projections of the raw image and the restored image shows the effect of deconvolution. 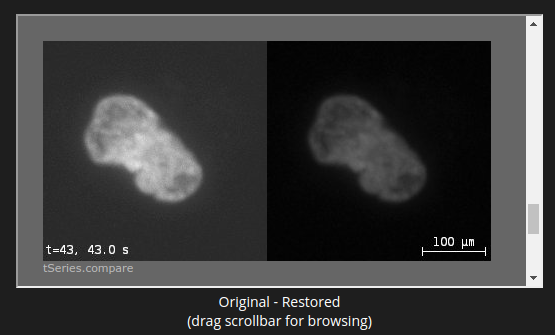 A comparison of the Simulated Fluorescense Process in both the raw image and the restored image also shows the effect of deconvolution and difference in noise. The slicer allows for a comparision of the raw image and the restored image slice by slice along the Z direction at any depth. The time slicer allows for a comparision of the raw image and the restored image frame by frame. Click on the corresponding links to download any of the movies to your local computer. Notice how useful these automatically made movies are for prepraring presentations. The selected colocalization coefficients of each two channels are listed in a table with an entry per frame. 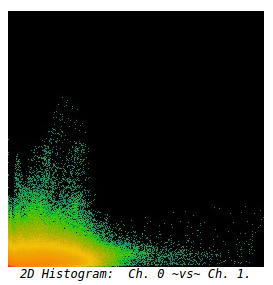 Also, 2D histograms show the correlations between any two channels. Lastly, the colocalization maps show the regions where colocalization between any two channels is strongest. 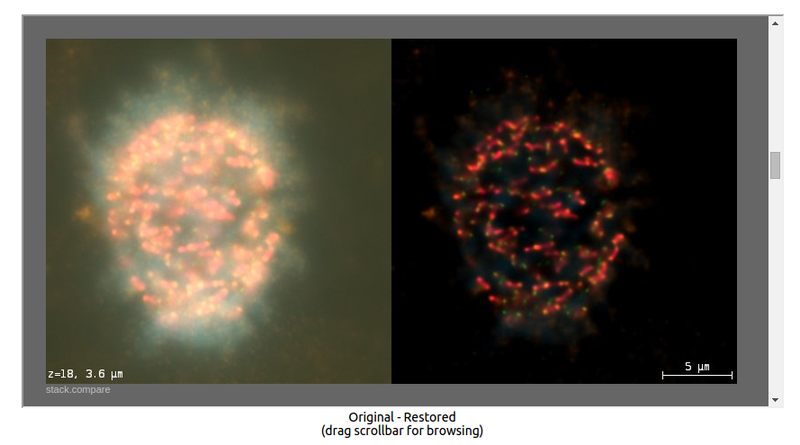 HRM also gives feedback on all the parameter values used during deconvolution. This is particularly useful when the parameters are read from the image metadata. 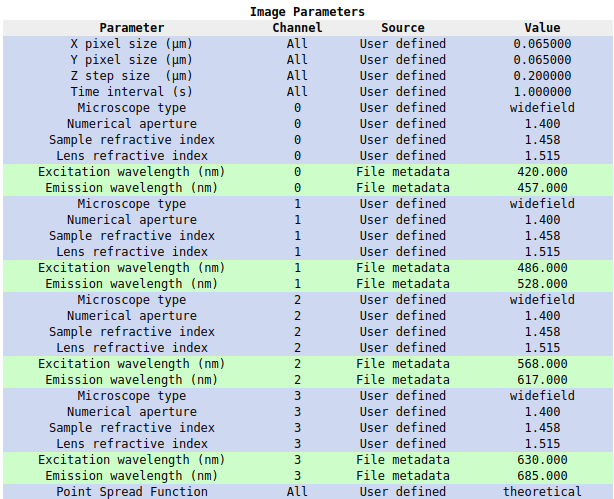 Notice that green entries indicate parameters loaded from the image metadata, whereas violet entries indicate parameters defined by the user. The exact steps followed by Huygens to process the data can be found on the Huygens log, under the link . Notice that all these results along with the deconvolved dataset can be donwloaded by clicking .